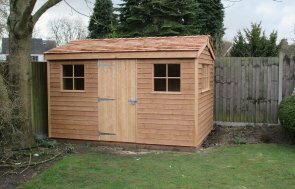 This Superior Shed has recently been installed in our customer’s garden in Earley, Berkshire. 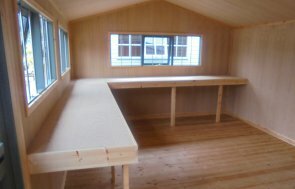 This shed is 2.4 x 3.0m is size, and the customer has bought it for use as a bit of a games room for her children. The size of this shed will be ideal to fit a pool table in, and will just create that extra bit of space for her children to get out of the house and have their own play area. 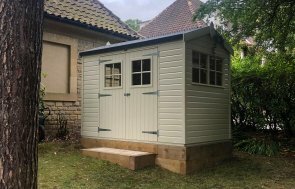 There is an apex roof on this garden shed, which has been covered in our durable heavy duty felt, and the colour of the felt blends in well with the choice of paint colour, which is our Pebble Valtti paint. This is a very tidy looking shed, a look that is helped along by the shiplap cladding, which gives the shed a smooth finish. There is a single door on the gable end of the shed, and on the side there are three windows, two of which can be opened. Each of our garden buildings are built at our Norfolk factory HQ near Swaffham using slow-growing FSC® certified timber sourced from our partner sawmill Northern Sweden. If you would like your own garden building, you can either Contact Us or call 01760 444229 to get through to one of our team who will be more than happy to help talk through your options, or you can use our Online Garden Building Planner Tool to get an instant quote. Either way, we look forward to talking to you soon.